The world of digital economies, innovation, and global value chains (GVCs) is changing rapidly. Every day there are stories about new technologies, services, and products that present unexpected possibilities and unforeseen challenges. There is potential to harness these innovations to revolutionize development across ASEAN, especially through regional initiatives that support its small and poorer members. If ASEAN countries are to maximize these opportunities, they will need international, regional, and national rules that facilitate digital industrialization, close the digital divide, and correct the development asymmetries that currently favor developed countries and their corporations. The wrong rules will deny ASEAN writ-large those benefits. Driven by this spirit, ASEAN countries have pushed for binding commitments from the Regional Comprehensive Economic Partnership (RCEP) members on e-commerce. In February 2015, the Trade Negotiation Committee (TNC) of RCEP endorsed a proposal to establish a separate working group on e-commerce (WGEC) with the aim of formalizing a chapter on e-commerce in the final agreement. The agreement and the issues being negotiated have been kept confidential, but a few chapter drafts leaked including the “Terms of Reference (TOR)” for the WGEC. The leaked drafts showed that the e-commerce text tabled and promoted by Japan in RCEP largely mirrors the Comprehensive and Progressive Agreement for Trans-Pacific Partnership (CPTPP), also known as the Trans-Pacific Partnership agreement (TPP or TPP-11) template which promotes the American e-commerce model. The new e-commerce regime is not about “free trade” and barely about real commerce. As with the WTO’s Agreement on Trade-Related Aspects of Intellectual Property Rights (TRIPS), it aims to protect and entrench the oligopoly of first movers. But even more than that, the proposed new global norms would consolidate the dominance of the technology giants over digital technologies, infrastructure, services, and – above all – data, the new oil of the 21st century. ASEAN economies risk being locked into a state of dependency that some are describing as digital colonialism. Promoting actual cross-border commerce by eliminating customs duties on electronic transmissions, streamlining transactions through electronic authentication and e-signatures, and international cooperation. Under this regime, a government cannot stop a service supplier from another party operating in its country from transferring or processing data offshore, including personal or commercial information. While the rules do not explicitly refer to “storage” of data offshore, such a restriction would be covered as a “measure that affects trade by electronic means.” Governments are not allowed to even specify a list of acceptable countries to which the data can be transferred and processed. Under TiSA, the operator would simply have to establish a need to transfer the data offshore “in connection with” the conduct of its business (TiSA, article 2.2). In other agreements, it is “for the conduct of the business” (TPPA, article 14.2.2), which would protect the export of data by operators of search engines and digital marketplaces, as well as sectors like insurance, tourism, online education, and mining. In practical terms, an Australian private hospital operator in Thailand could not be prevented from transferring Thai patients’ health data outside the country. The Indonesian government could not require a U.S.-owned mining operator to hold data, such as safety records or inventory, within Indonesia. Uber could not be required to store financial records of local transactions in Malaysia for tax purposes. When personal and commercial information is held offshore, including in the cloud, it is beyond the subject’s control. The company that holds the data will choose the repository, but even it may not know which country the server is located and whose privacy and consumer regimes apply. Once the data is offshore, the government may lose the ability to regulate its use, abuse, or sale unless it can impose effective licensing or technical standards within whatever domestic regulation disciplines apply in the agreement. In addition, a government cannot require the use or location of computing facilities inside the country as a condition of supplying a service in that country (TPPA, article 14.13). “Computing facilities” means “computer servers and storage devices for the processing or storing information for commercial use” (TPPA, article 14.1). This ban is a major disincentive for governments to invest in upgrading their local infrastructure for domestic use in the hope of attracting foreign firms. Lack of such investment reinforces the country’s long-term dependency on foreign-owned and located infrastructure. On top of that, the United States promotes a further rule that content supplied electronically must not receive more favorable treatment because it was created, produced, published, contracted for, commissioned, or first made available on commercial terms locally, or where the creator, producer, developer, or owner is local (TiSA, article 10.3). That rule would prevent central or local governments from using preferences to support local firms to develop content or requiring use of local knowledge and cultural content to enhance the quality of the service provided. This restriction is most obviously targeted at the entertainment industry, apps and games. But it applies equally to services like education, consultancy, and research and development. As noted in a recent paper, developing countries, including ASEAN, are rule-takers not rule-makers in the new generation mega-agreements. The normative regime that is systematically being developed aims to guarantee the continued monopoly of already dominant, mainly American, companies over source codes, data and digital technologies, and facilities. The author of the paper, Parminder Jeet Singh, warns of a significant mismatch between the most important geo-economic and geopolitical implications of the digital phenomenon and the way developing countries have been viewing it at the global level. This has resulted in developing countries getting trapped in new extractive global economic relationships, and also excluded from processes shaping the global digital norms and policies. It is crucial that ASEAN members have the time and flexibility to identify and develop appropriate national and regional regulatory frameworks that can advance their digital industrialization, individually and in solidarity. These frameworks might include rules on: Binding technology transfer and mandating disclosure of source code to encourage the development of infrastructure and domestic suppliers; requiring data protection and data localization, joint ventures, and use of local facilities for the development of domestic capacities; training of a skilled IT workforce; and commitments to financial assistance for technology development and infrastructure in order to bridge the digital divide and facilitate e-commerce. The new normative regime that is being promoted by developed countries in the RCEP would foreclose those options in ways that are practically impossible to undo. ASEAN members will need to resist those proposals if they are to maintain their regulatory sovereignty and the policy space to capitalize on the 21st century digital revolution. Eva Novi Karina is a lecturer at Pembangunan Nasional “Veteran” University, East Java and a researcher at the Center for World Trade Studies (CWTS). 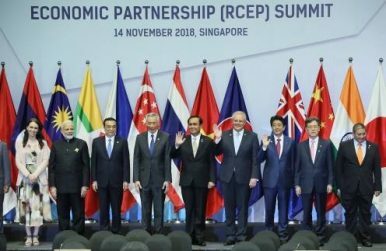 The RCEP sounds good in theory, but implementation is a tall order.